Product #48155 | SKU DSC-RX0 | 0.0 (no ratings yet) Thanks for your rating! 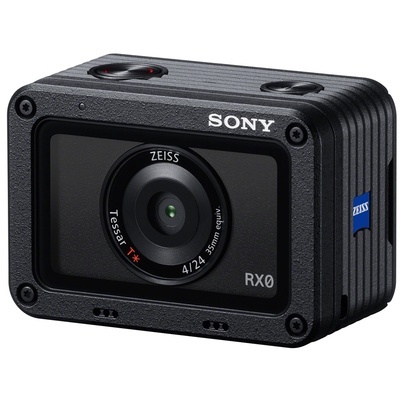 The lightweight Sony RX0 Ultra-Compact Camera offers professional image quality in an action camera–sized form factor. Capable of outputting uncompressed 4K UHD video, it also records up to 1080p60 in-camera at 50 Mb/s in XAVC. A Zeiss 24mm-equivalent f/4.0 lens provides a wide, but not distorted, field-of-view. Its 21MP 1" stacked Exmor RS CMOS sensor produces minimal rolling-shutter artefacts, and is protected by the RX0's waterproof, crushproof, and shockproof body. Use the versatile, diminutive RX0 as a single camera that fits almost anywhere, or for multi-camera recording, timecode-sync up to five cameras. When connected to a Wi-Fi router, greater than five cameras can be synced, suiting the RX0 for concerts, stunts, and other multi-camera applications. Camera control is offered via the Sony Play Memories smartphone app (iOS and Android). A 1" Exmor RS CMOS sensor provides extended dynamic range and high-speed readout, even at super-slow motion rates of up to 960/1000 fps. This anti-distortion shutter features speeds up to 1/32000 per second, capable of freezing the action with minimal skew. Customise your image capture with multiple Picture Profiles, including the versatile S-Log2 gamma setting.